Most companies don’t think of an employee’s first day as an opportunity to build loyalty and retention. In fact, some companies fail to provide even the basic onboarding that sets a new hire up for success. But here’s the thing: your employee’s first week can actually influence the growth of your company. Companies that excel at onboarding and employee retention experienced 2.5 times the revenue growth and 1.9 times the profit margin of companies who struggle with these two critical skills. That’s why the successful onboarding of new hires is critical to retaining top talent and driving the growth of your business. 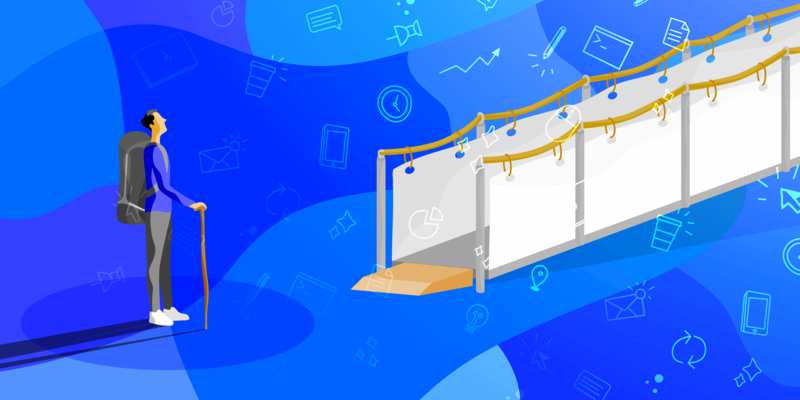 To kick things off, we’ve created a customizable onboarding checklist you can use with all new hires. Get the most out of this onboarding checklist by implementing these 10 ways to turn new hires into lasting employees. Onboarding is an ongoing process, not a one-time event. The infographic below highlights some of the reasons why effective employee onboarding could play such an important role in turning new hires into lasting employees. Your new employees typically aren’t going to make a decision to stay or leave in a few years’ time; they will likely make the decision in their first few days. So making a good impression on them even before they start is critical. Warby Parker has developed an onboarding program that includes a series of steps and tasks for the new employee, as well as the company. Their new hire onboarding begins before a new employee even arrives on their first day. To start, a welcome pack is emailed to them. The pack includes information on the company’s history, values and what the employee should expect on the first day, first week and first month of work. Once the employee has accepted an offer, provide detailed information regarding the logistics of their first day, such as where to park, who to meet in reception, if lunch will be provided, what to bring, and the dress code. Ensure that all access and preparations are completed in advance so that on the first day, your employee will have a place to sit, building and system access, and any necessary hardware, software, and//or supplies to begin working right away. Provide access to a portal or system where the new employee can complete any onboarding paperwork required, such as reading the code of conduct, or filling out payroll forms in advance of their first day. Provide the new employee with access to any company social media sites or pages, so that they can start observing the culture and begin identifying with the team in advance. Supply an agenda for their first day so that your new employee will know who they will be meeting and what to expect. Send a welcome pack with details about the company culture, where it is headed, and a personal note or card, etc. Send a video on the company culture that showcases some fun and different aspects of the work. Send a company directory and tell them who they need to report to. Assign them a learning plan and mentor for training and to answer any questions as they progress. Send them a fun questionnaire so that the rest of the team can get to know them a little better before actually meeting them. Research has shown that new employees who have not yet built a relationship with coworkers are less likely to ask questions and seek out information. So employees who feel disconnected from others are less likely to be engaged or seek help if they are struggling with any problems. They are also more likely to seek opportunities elsewhere. Percolate is one of the companies with a comprehensive onboarding program that starts on the first day. On day one, you are shown to your desk and provided all the necessary tools to accomplish your role. One of the first tasks includes signing into Asana, which will have a task inbox with several onboarding tasks. The tasks are assigned from a master template and includes tasks for the manager, and other employees in the company. For the employee, one of the tasks in Asana includes reading “Day one @Percolate” an 18-page Google doc detailing the history of the company, culture, values, how to create strong passwords and guidelines for running meetings. Ensure every new employee is paired up with other new employees or with a buddy, trainer, or guide. Someone should always be there to help them with questions and problems, and to help them engage with the company. Focus on what the employee needs out of a first day and make sure to provide them with useful information about the company. If you’ve followed the first suggestion and started onboarding early, you can tackle the first day paperwork early and focus on more important engagement activities. Promote a culture of belonging. Ensure your new hire is given a tour and is introduced to team members and other employees; particularly other new employees who will be able to relate to any first day jitters they may have. Plan for lunch so that your new hire has the opportunity to eat with colleagues. This is an easy bonding opportunity in a social environment. No one wants to be that unpopular new student alone in the cafeteria. Ensure all security access is taken care of in advance so that new employees will be able to log into any necessary systems and access any secure areas as needed for their position. Make sure their desk, phone, laptop, etc. are set up with guidance as needed. There is a direct correlation between getting employees up to speed quickly and retaining top talent. The Aberdeen Group found that best-in-class companies had 62% of their new hires meet their first performance milestone on time, and 91% of those employees were still part of the company after their first year. In contrast, the worst performing companies only had 17% of their employees meet their first milestone on time, and only 30% of them remained at the end of the first year. Game developer Zynga understands the importance of making employees productive as soon as possible. Their university-specific program pairs up new grads with mentors as part of their internal onboarding program. Both parties are required to work together to innovate and learn from each other. To get new grads up to speed, they start off with a weeklong intensive bootcamp. Provide clear job descriptions and outline exactly what is expected of the employee. Make it clear how the role fits into the overall goals of the organization and why it is important. Provide hands-on training with coaching and support. Move all the ‘noise’ out of the way, such as tackling administrative paperwork before day one. Have a team or buddy system in place so that new hires are not left alone to figure things out on their own (remember from above that they are less likely to seek out answers on their own at this stage). Give them tasks to complete to allow their training to be ‘live’ in real environments, with supervision as necessary. Allow new hires to have responsibility and accountability for tasks. Research shows the best-in-class organizations use workforce management, provisioning, and new hire portals more often than other businesses. All new hires have a set of common questions about the business, departmental procedures, templates, etc. A single repository of such information would make things easy to manage, update and find. Cosmetics company L’Oreal created a game-like app for onboarding that is meant to serve as a support buddy and an information center. It allows new hires to learn through multiple content types, such as videos, pictures, text and even quizzes. HR and business policies, such as the code of conduct and dress code. Floor plans and phone lists with pictures of employees so that new hires can match faces to names and see where people are located if they need to find someone. Any forms that need to be completed, such as payroll information. Standard FAQ sheets regarding the general office and culture (i.e., is there a casual-dress Friday), how to log on to systems, who to contact for IT issues, how to log time, and key resources and who to contact for different functional areas. Online training videos and apps that employees can complete at their own pace or revisit later if they are looking for a refresher course. Social engagement opportunities, whether it’s similar to an internal social network, or a SharePoint site with updates about upcoming company get-togethers. Perhaps, it is time to move past the idea of an onboarding buddy and involve an entire cross-functional team. This will help your new hire engage with other departments and become a member of the corporate community faster. Forms management – includes the collection, tracking, and management of all forms. Task management – includes all activities related to onboarding the employee, including meeting managers and leaders, on-the-job training and other protocols. Socialization and introduction to the company culture. Buffer, a company similar to Twitter, assigns three buddies during onboarding, each with a different role to play. There is a Leader Buddy, a Role Buddy, and a Culture Buddy, all of whom help new hires through the onboarding process. Plan company lunches or meet-and-greets to introduce new hires to the wider organization. Incorporate time with other departments in the onboarding schedule, to allow new employees to gain a better understanding of how teams work together and to engage with more of the business. Have more than one work buddy to answer questions and offer support. Provide regular follow-ups and check-ins with the HR manager, and the team or department hiring manager. Incorporate team-building sessions and exercises into the onboarding process. Form completion is a necessary evil in the overall new employee onboarding process. The Aberdeen group study showed that best-in-class companies recognize that the goals of a strong onboarding program are focused around increasing employee engagement and productivity. This is a shift from the traditional perspective on focusing on being compliant with various employment laws and regulations. Facebook has employees launch into their first projects within 45 minutes of starting with the company. They believe in jumping right in at the deep end (discussed in #3 above). In order to make that possible, the company has to be incredibly efficient with all of the other onboarding tasks (looking at you, paperwork). Send out forms to employees in advance of their first day (as mentioned above). Put forms online and automate them as much as possible to reduce time. Have a buddy walk new hires through the forms to make completing them easier and more efficient. Load forms into a portal that can be accessed at any time so employees can complete them during a quiet period, at home, or throughout the week. That way they won’t have to set aside a large chunk of time in one sitting (refer back to #4 to see how a resource center can help with this). Studies have shown that new hires feeling socially accepted was a key factor in their ongoing success within the company. The building of social connections at work has a strong impact on engagement, which is one of the key measures of a successful onboarding program. At Warby Parker, a software program called Lunch Roulette randomly assigns two groups of four people to go out to lunch together after weekly team meetings. Lunch is paid for by the company. The program also ensures that no more than one person from any one department is selected. This allows new hires to meet with others in the company in a casual setting and build relationships. Arrange team lunches, company barbeques, or other organizational social functions. Organize introductory sessions and time spent with members of different teams and departments. Build an active and engaged social committee that organizes staff functions and helps welcome new team members. Co-locate employees in open area settings that promote more opportunities to meet, talk, and collaborate. Make new hire announcements within the company so that all employees are aware of new hires, making it easier to reach out and welcome them. Research has found employees who feel they have strong and consistent supervisor support are more engaged and more successful. How do you implement that in your organization? Be clear about what is expected from your new hire at each stage of their onboarding, and then as they ramp up and as an ongoing part of their career. LinkedIn makes sure each new hire ends their first day with an in-depth roadmap in hand for the coming weeks. This allows all new hires to know exactly what is expected from them throughout the entire onboarding process. Create a position agreement that clearly identifies what is expected from employees in that position, and also what they can expect from others, such as management support. Build measurable objectives and key results metrics. Ensure that the measures are well understood by your new hire and that each score is well defined, so there is no confusion about what would be considered ‘great’ versus ‘exceptional’ on a point scale. Clarify what autonomy employees have, which decisions you trust them to make on their own, and when you expect them to push problems or decisions higher up the command chain. Defined expectations should exist relating to every important business aspect, from tasks to behavior to dress code. Any ambiguity can leave room for employees to stress over potential missteps. Nearly 90% of new hires make up their mind about whether or not they want to stay with the company within the first six months. The cost of such turnover varies by wage and the role, but can easily run into the tens of thousands of dollars, if not more. To stem the tide of new hires leaving within that timeframe, it is important to get their feedback and to engage them. In other words, proactively make an effort to understand if something is causing them to be unhappy. So you can address it and fix it before you lose them to the competition. The Motley Fool recognized that employees are not always comfortable providing honest feedback to their bosses. They tackled this problem by creating feedback coaches, who have been trained to gather feedback from employees in a manner designed to remove fear from the conversation. Have multiple resources request feedback on an ongoing basis. For example, have the HR manager, the direct manager, and a designated buddy all regularly check in on how your newest employee is doing and find out if they are struggling with anything or need some help. Create a ‘feedback coach’ position, where a trained person who is not in the new hire’s chain of command can elicit feedback on a regular basis. Allow for anonymous feedback by creating online portals or surveys to collect feedback without employees having to provide their names. Make sure you act on any feedback provided. If employees feel like no action will be taken, they will be less motivated to come to you with feedback. 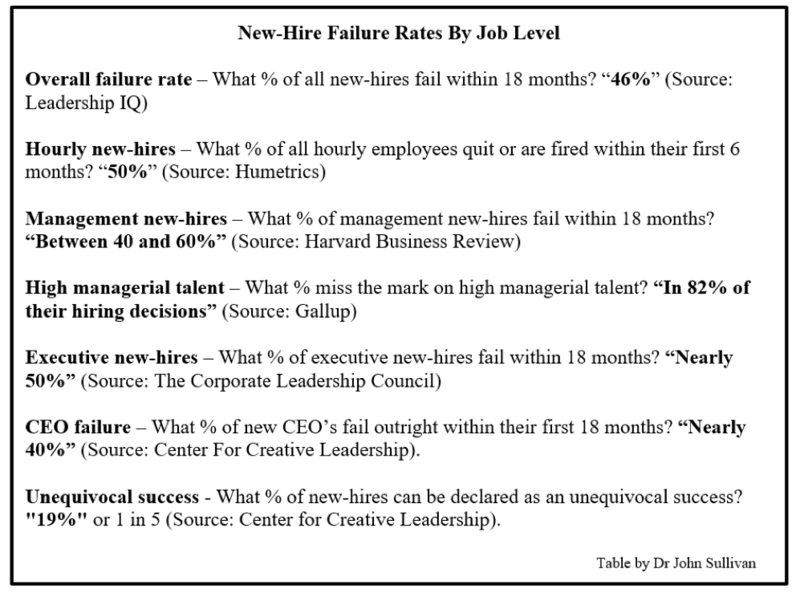 The table below shows the failure rates of new hires at different levels of management in five independent companies that have high new hire failure rates. 60% greater annual improvement in revenue per full-time employee. 63% greater annual improvement in customer satisfaction than those with an informal onboarding process. Zappos, for example, offers a five-week course focused around the culture and values of the company. At the end of the five weeks, they offer employees around $4,000 to quit if they feel like the culture is not the right fit for them. The company knows that if it’s not a good fit, it will impact engagement and ultimately performance. Create company social media accounts and share content that encompasses the culture. Include a background of the company history and culture in the onboarding curriculum or welcome pack. Provide a ‘culture’ buddy who is a longer-term employee so that new hires can ask questions about the company culture. Provide a FAQ guide in the centralized database related to cultural facts and frequently asked questions. Include new hires in meetings, get-togethers, and events that portray the company culture. An average business will lose 1 in every 6 new hires every month within the first three months of employment. Considering the length of time and the expense it takes to replace employees with new external candidates, this can have a significant negative impact on the growth of your company. In order to not lose your best new employees to the competition, incorporate these 10 best practices into your company’s onboarding process. After all, a well-defined and planned onboarding program increases your chances by 58% that your best employees will still be with your company after the three-year mark. Vinay is the content marketer at Hubstaff. Whether it’s website content, articles or emails, he strives to delight customers and increase company revenue. He also champions access to remote work opportunities. You can find him on Twitter.